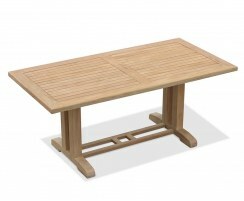 These Cadogan teak pedestal tables are available in a range of sizes to suit your space. 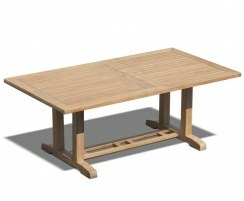 The pedestal base allows you to tuck chairs under the table for space-saving convenience, whilst offering more legroom for your comfort. 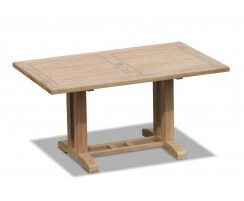 These rectangular pedestal dining tables are ideal for homes, gardens or patios, and for commercial settings such as cafes, pubs and restaurants. These Cadogan teak pedestal tables are sure to impress, featuring extra-thick 4cm table tops and a robust construction to last through the decades. 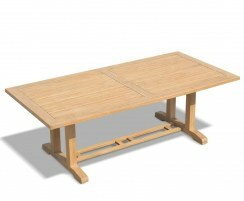 All delivered fully assembled for your immediate enjoyment, these rectangular pedestal dining tables can be left outside all year round in all weather whilst only requiring minimal maintenance, representing excellent quality and value. 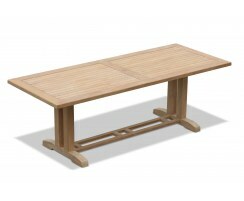 View the full range here and order online or contact us to discuss any bespoke requirements you may have.